Now a Top 40 Amazon Bestseller! Damn, damn, damn, damn, damn. Kennedy Ryan does this EVERY. SINGLE. TIME. She kills me with her words, her characters and her stories. How I still have a beating heart after this is a mystery. This author is insanely talented, she has this innate ability to draw you into her character’s worlds, lives and relationships and makes you live and breathe every single step. They hurt, you hurt, they laugh, you laugh, but you FEEL EVERYTHING. And damn, did this book make me feel. Even though Kennedy Ryan writes a long book, it never reads that way, in fact her words are effortless, they whisk you away and before you know it, an afternoon has passed, and the book has been devoured and that was how I found myself after reading this book. At the end though, I had nothing. It was one of those books where you look at those around you and think you don’t know what you are missing. They say a reader lives a thousand lives, well I’ve just added another two, two that I will never ever forget. Kennedy Ryan delivers a powerful story, an unforgettable one, one so viscerally delivered that you cannot help but be affected by EVERYTHING. Kennedy Ryan pulls punches with it’s delivery, uppercuts, body shots, the whole enchilada and she doesn’t hold back, and the hits just keep on coming. My head…buzzing. My heart…battered and bruised but as with any Kennedy Ryan book she expertly puts you back together again, but what an emotional rollercoaster to get there. I am deliberately keeping this review vague, you need to go into this one blind and read the book the way the author intended. This book is harrowing at times, extremely thought provoking and incredibly honest and raw. It does not make easy reading and at times I felt physically sick, but this is what I love about Kennedy Ryan, when she embraces a particular subject, she goes all in, she pushes the envelope. Iris was a fantastic heroine, who, had life dealt her a different card would not be in the situation she finds herself in during this book, through no fault of her own. However, her inner strength, her determination and her sheer will to survive is what gives her life story its happy ending. Kennedy Ryan takes a sensitive subject and delivers it with honesty, compassion while keeping her integrity. Kennedy Ryan shows the effects it not only has on the individual but the people around them and they are often forgotten in these types of stories. 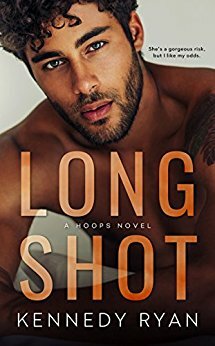 Set in the baseball arena, Kennedy Ryan delivers a hero that will top many a book boyfriend list and show another on the total opposite end of the spectrum, but for all intents and purposes, this is definitely Iris’s story. Make sure you can read this book in one sitting, because once you start, you will not be able to put it down. Make sure you have plenty of tissues, preferably a glass of something strong and your trash food of choice, chocolate, ice-cream etc, you will need it. You have been warned. But most of all, be prepared for an EPIC read, one you will never forget and one you will not stop thinking about for a very long time. Seriously AMAZING!